Sometimes in life we stand out, and are made to feel insecure by others. It happens to everyone at one point of their lives, be it school or workplace, or even at the supermarket. It can zap away all your confidence, and make you feel less than nothing. I have had the most experience in this with my weight. Where it seems to be okay for people to ask me if my thinner friend is single, but nothing else. It is also apparently okay for people to call me names for being fat. 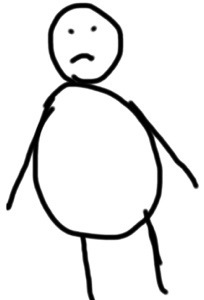 Now being the ‘overweight friend’ my whole life, I know what shape I am, and I don’t expect to be shouted at by strangers about it. Most of the time, a couple of deep breathes can get me over the angst I feel, but sometimes the comments get stuck in my head. At it’s times that I can get worked up. I cry myself to sleep at night and just hate myself. I believe that a lot of people, like myself, eat when they are unhappy. And the negative reactions that we can sometimes get from people we don’t even know, can make us very unhappy. It is a known fact that happy people are more proactive in general, hence workplaces spending millions making their workers happier. If an overweight person feels better with themselves, then they may stop gorging on crisps, and will chance going for a walk or to the gym. And the best thing is, if they feel good about themselves, then any negativity that is thrown in their direction, has more chance of being ignored. Also, if a person can learn to love themselves, then anything else that they want to seems a little more in hand’s reach. This entry was posted in Life, ramblings and tagged appreciation, fat, life, people, weight. Bookmark the permalink.